Living in Italy, Europe, very often i post pics of European airlines and models, but there are other continents and countries so this time i want to post all the models Herpa produced of USA airlines, especially the airlines still flying and the models part of the current fleets. Looking at the existing airlines and the active models i noticed that, especially about the three majors (United Airlines, American Airlines and Delta Air Lines), we are not missing so many models. I am happy Herpa produces American Airlines, Delta Air Lines (my favourite) and United Airlines models, beautiful news the arrival of JetBlue and Allegiant, Alaska Airlines has always been a good client for Herpa, sad the missing of Spirit, Sun Country and Frontier even if i am sure Herpa will do everything possible to obtain licenses from them. Hawaiian Airlines is well represented and Sky500 helped us to have some A330-200's special livery. Virgin America, one of my most favourite low cost airlines, merged with Alaska Airlines and this is a pity because i wanted to have its A319's and A320's in 1:500 scale. About Southwest Airlines the speech is different: the first and most important low cost airline of the world has been an important client for Herpa since may years, then this beautiful idyll finished in 2012, when Southwest received the first B737-800WL. We all, i imagine, where waiting for the release of the B737-800WL but, after many months, we knew that Herpa lost Southwest license. So we haven't the B737-700WL and B737-800WL new livery and related special liveries. Stay tuned, tomorrow i will start with the fleets. Re: USA airlines current fleets. I am happy there is progress in Herpa's US based releases, especially for our US friends. But many of these models are now being sold at extreme prices, like the Delta A330-300, American 738, United 738 while there are some icons still missing (resp. the DL 757-200, the AA A321 and the UAL 767-300ER). But Herpa has broadened their horizon past the major 3 and with the Alaska fleet well covered (but release a freaking 737 in their new livery), as well as JetBlue's, it's time to look for new licenses. Obviously living in the US these carriers are my primary interest especially when realizing a true airport. I agree on many points charter made. In my eyes i see the biggest need is to continue the variety away from the big 3 airlines. It seems this may slowly be happening, having jet blue in production and Allegiant soon which is great for everyone! I would also like to see more attention to more regional aircraft as this area is lacking in my opinion. I hate to say this next part but while i do feel overall that since i have gotten back in the hobby the overall model option count is better then before, i do think it may just look bad for U.S airlines as while they do have huge amounts of planes in the sky its only really a dozen airlines and when you compare that to the hundreds in the world it really makes it seem like they are being forgotten when maybe they are not... if that makes sense? Although after that please Herpa continue to expand and cover all necessary U.S models! Last edited by Slash01z; 03-22-2019 at 01:08 PM. Another thing to keep in mind is that with the new livery we'll be needing all new United fleet. I do not relish waiting for new models, and don't doubt that it'll take 5+ years for Herpa to make a decent selection, whereas the 1:400 collectors will have them inside 2. There is also the matter of Regional Jets (or the lack thereof). On the other hand, seeing Allegiant and more JetBlue is definitely a promising sign! The regional birds, such as Delta Connection and United Express E175, are also missing. But hopefully these gaps will be closed soon. Herpa have since released the American 777-200ER and 757-200, which were both very requested by us, collectors. In my opinion, would be a great move if Herpa could re-release a few models, since they have become very rare. - United B737-800 could be re-released with the current mould and featuring Split Scimitar Winglets and Wi-Fi dome. Would be great! - United B767-400ER could have a second production, since this model have also become so rare. 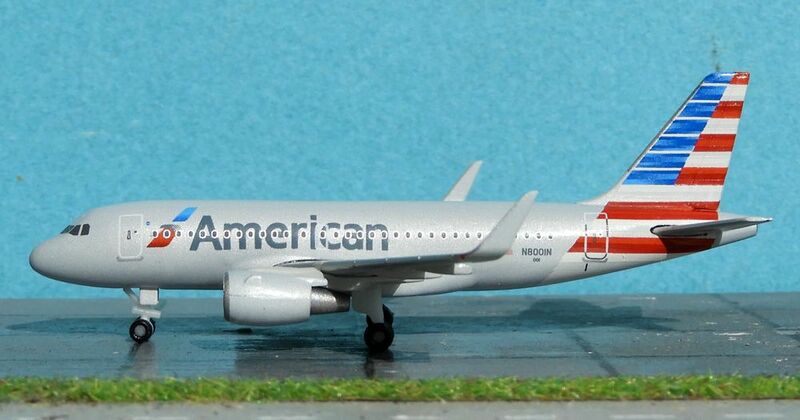 - American B737-800 could also be re-released with updated reg, Wi-Fi dome and maybe paint improvements. I also hope Herpa will finally release some cargo birds. ABX Air 767 and Amerijet 767 would make me ultra happy!!! There are also plenty of 747s and MD-11s. However, both moulds currently used by Herpa are terrible (in my opinion), so i'm not really looking forward to this. The National B747-400BCF would be amazing, but the bad mould backs me off from it. Last edited by LeoMuse747; 03-22-2019 at 02:23 PM. The sad thing is the lack of airlines and models in the last years. Even in USA i am sure we will arrive at 4/5 airlines because of the merges and of the banckruptcy. If we think that USA was full of airlines, all majors, like Northwest, Pan Am, TWA, US Airways, Air Tran, Midwest, Eastern, Continental, then United, American Airlines, Delta...and now they are just 11 we are facing a dramatic panorama! Just a new merge and (i hope never) a banckrupt and the remaining airlines will be less than 10! Abd what about the airplanes? Until few years ago the sky was full of different models: DC-10, L-1011, MD-80, B737-300/400/500, B737-700/800/900, Fokker 100 (AA), B717, B767, B777, B747, B757, A319/320/321, A310, A300, A330-200 and -300...now we have the A320family, the B737NG family, the A330, A350, B787, B777, both B757 and B767 are disappearing while the beautiful Mad Dog has been retired by all the airlines except Delta that continues to fly 79 MD-80s and 37 MD-90s. The "flattening" continues for airlines and airliners and this is really sad! Last edited by Charter; 03-23-2019 at 12:31 AM. Let me start with my favourite airline, Delta Air Lines. You too? Delta rules! The logo on the tail...simply wonderful. I don't think United will unveil a new livery so extremely beautiful to exceed Delta. Alaska Airlines. After the merge with Virgin America the Airbus family entered in Alaska Airlines fleet, in fact Herpa produced the A321neo. Now we are missing the B737-700, A319, A320 and the E175. The side-on pics are a lovely way to compare the models and to view their features. On the other hand, the MD-88 model is great. I'm glad I have it! The 737 in current regular colors is also missing!!! 700, 800, 900/900ER. Yeah I'm surprised to see Alaska's backbone of the fleet not in 1:500 in their new livery. Ale my friend, I’m still looking for Delta aircrafts in both scales which go to Toronto as that’s my international hub in Canada (as also Calgary - airlines common to both Toronto and Calgary). Any suggestions? I could use a few heavies or B737-9 for any route. Much appreciated, Ale. I would use the B767-300, still 79 in fleet my friend. I was doubtful about the new livery then i started to love it! All beautiful models but the A319WL is especially wonderful! A320 and A321 still missing and i have to add the MD-80 because 28 of them still flies with old American Airlines livery.